Reflected sunlight is known as glare or glint. 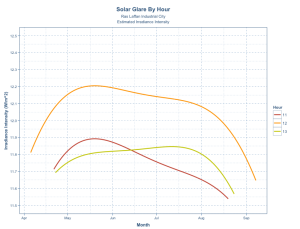 This post is a simple case study for assessing the glare impact from a PV installation in Qatar. It outlines the basic concepts behind glare assessments and provides R source code to facilitate glare studies. Diffuse reflections represent reflected light that is scattered in all directions and is typically caused by uneven surfaces, such as rough water, gravel or dust. In general, diffuse reflections are low in intensity. A maximum of 28,000 square meters (sqm) will be consumed by the installation of 1 MW of crystalline modules and 1 MW of thin film modules. Actual land use will depend on the solar conversion efficiency of the modules actually purchased. An additional 4,000 sqm will be consumed by open spaces between the panel rows and other balance of plant needs. In total, the project will have a maximum of 3,380 crystalline modules and 10,080 thin film modules, though actual count could due less. Using the QND95 coordinate system of Qatar, the front row or string of the PV modules will have a center point located at 222576 (Easting) and 464285 (Northing) . This point is located 192 meters directly North of the main office tower of the Multi-Purpose Administration Complex (MPAC) in Ras Lafan Industrial City. The layout of the solar PV array defines an optimal module tilt of 20-degrees, facing due South, to maximize annual energy production. The modules face directly into the windowed front of the MPAC office tower. 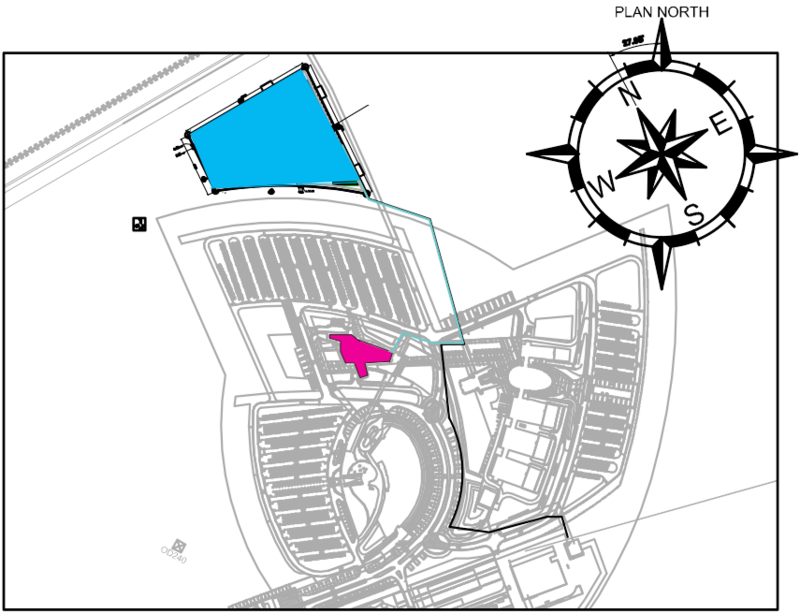 The building plans for the main office tower confirm that the North wall facing the PV power plant has a center point located at 222683 (Easting) and 464045 (Northing). The planned height of the building 48.5 meters. The project outline is shown below in blue and the MPAC outline is shown in red. Simplified balance of plant cabling is also shown with one cable (green) feeding the MPAC and a second (black) connecting with the MPAC grid substation. There is zero potential that a direct sunlight beam will be reflected by the solar PV modules and contact the windowed front of the MPAC office tower at any time during the year. Secular reflections directed south of the project total 401 years per year, between early April and mid-Setember. However, the angle of the reflected sunbeam is so steep the MPAC office tower is unaffected. Meanwhile, the intensity of the reflected light at its peak will never exceed 12.2 W/m2, assuming a reflection coefficient of 2% and the solar panels are clean. For the balance of the daylight production year, after the 401 reflected hours are accounted for, there are 4,406 production hours where specular reflections will be deflected away from the building and will be projected to the North in the direction of open sand and water spaces. The intensity of these specular reflections have a range starting at zero and a maximum of 5 W/m2, assuming a 2% reflection coefficient and the panels remain clean. Solar panels in the GCC countries accumulate dust immediately after cleaning, which will degrade the amount of radiation striking the reflective glass of the PV modules. Dust accumulations will also scatter the light received and reduce the potential for direct sunbeam reflections. Heavy soiling will eliminate reflections completely. Finally, the glass used on the solar modules is designed to minimize sunlight reflections to less than 2% of the irradiance received under standard test conditions. Certification to this effect is necessary to maximize energy capture, power production and human safety. The Sun elevation angle is the angle formed by the flat ground and a sunlight beam emitted by the sun. 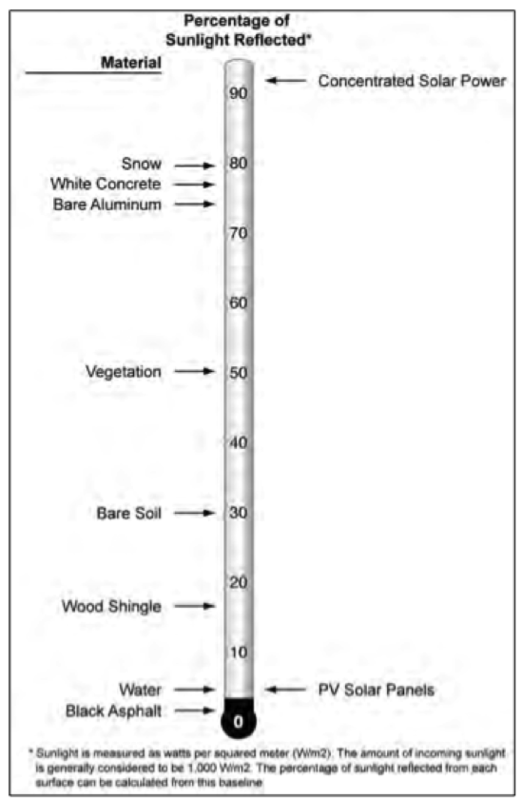 The Sun elevation angle starts at zero degrees in the East, it rises to a near vertical angle of 90-degrees at noon, and declines again to zero degrees in the West. The maximum angle at the project site is 87.47-degrees on June 20th of each year. 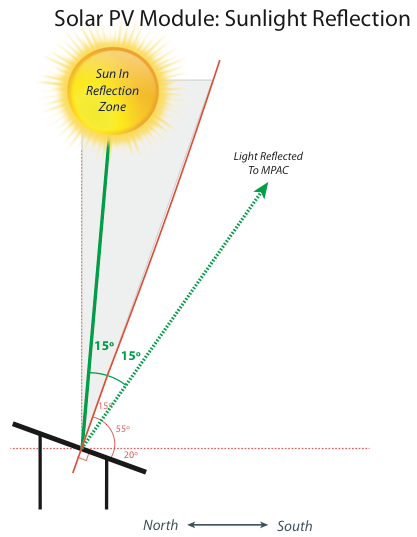 Elevation angle defines the angle of specular reflections. Specifically, the sunlight beam striking the surface of a module is either deflected away from the Sun (to the North) or reflected back toward the Sun (to the South). The reflection/deflection boundary is defined by a line perpendicular to the module surface, as shown in the two images below. A module set to a 20-degree tilt has a deflection/reflection boundary at 70-degree, as confirmed above using the angles highlighted in red and as defined by the horizontal plane. The angle of the incoming sunbeam is measures measured relative to the reflection/deflection boundary. The same angle is then applied on the opposite side of the boundary to determine the direction of the outgoing sun beam. The images make clear that sunlight will generate specular reflections directed toward the Northern building tower only when the Sun is between 70-degrees and 90-degrees. 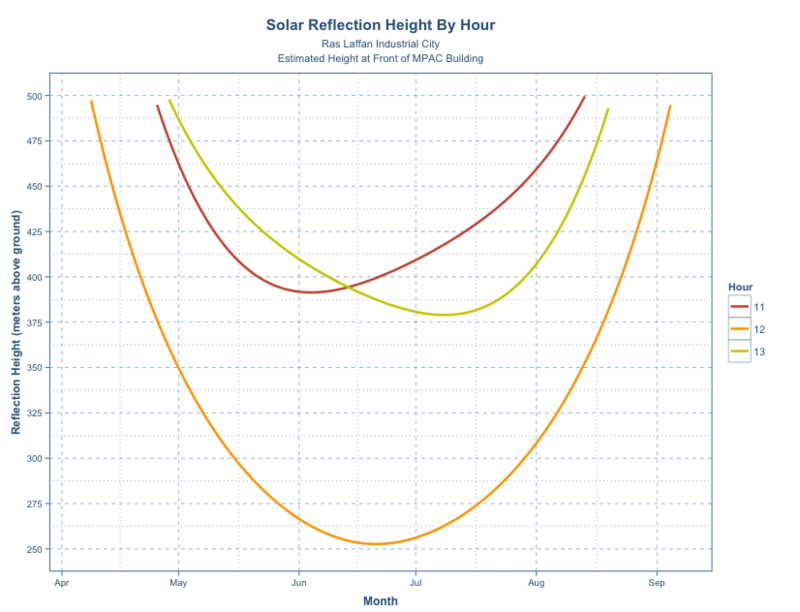 The following chart defines the sun elevation angle (y-axis) at the project site as a function of time of year (x-axis) and time of day (colored lines). 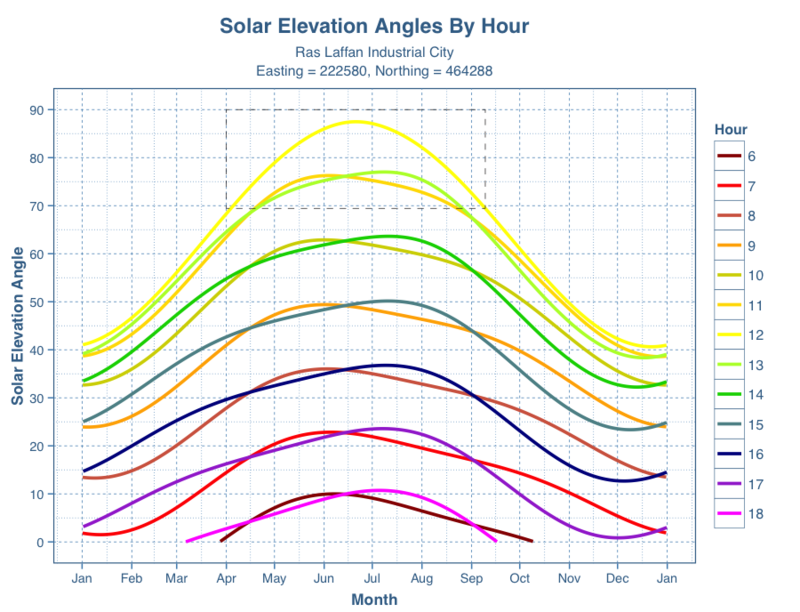 This data was generated using the solaR package for R, which contains several algorithms and open source code for Sun position tracking. Alternatively, C-code of for solar tracking can be obtained here. Direct specular reflections toward the MPAC building tower only occur when the elevation angle is greater than 70-degrees. The highlighted box in the image at left (click to enlarge) confirms this is possible only between 11:00 and 13:00 hours during the months of April to September. In total, there are 401 hours during the year when the project has potential to reflect light toward the MPAC building. 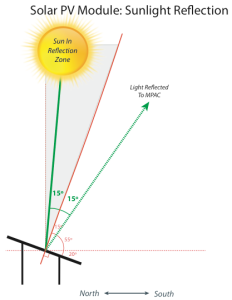 where ref.height is the reference height of the reflected sunlight beam at the front wall of the building, DRB is the angle of the deflection/reflection boundary in radians, Elev is the Sun elevation angle in radians, and setback is the distance between the first string of modules closets to the building and the front wall of the building. 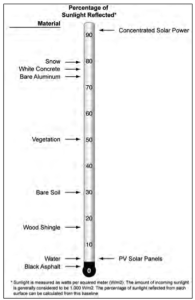 The estimated reference height as a function of time is shown in the chart above. The estimated height of the reflections is significantly higher than the 6-story building at 48.5 meters. Direct contact of the sunlight beam would only be possible if the building ranged between 30 and 60 floors. A “quick-n-dirty” scalar to convert total solar irradiance to ground irradiance. 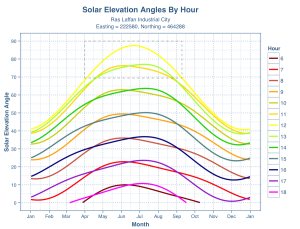 The scalar is an average of the ratio of ground irradiance observed at the project site divided by total solar irradiance. The glare coefficient or percent of irradiance reflected by the PV modules and sourced from the manufacturer. 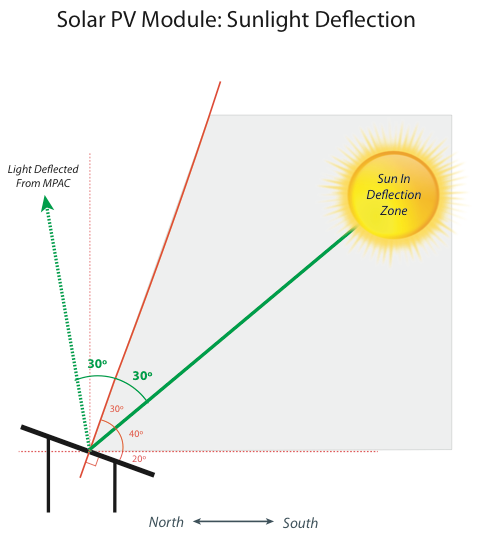 It is assumed that the glare coefficient is constant as a function of elevation angle. The maximum glare estimated is 12.2 W/m2. This exceeds the US aviation threshold of 7 W/m2. The estimate suggests that project glare could impact pilot safety and cause a vision “after-image.” In practice, the estimated glare is less than the glare expected from structural glass on office towers. Hence, well established risk mitigation would include the use of low cost glare-resistant sunglasses or visors. 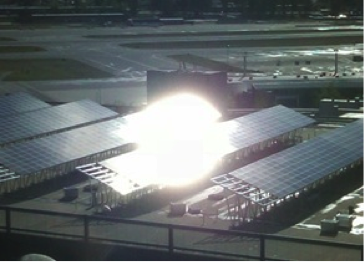 The estimated glare also suggests that site data collection is justified once the project is constructed to validate the accuracy of the desk-top estimates. 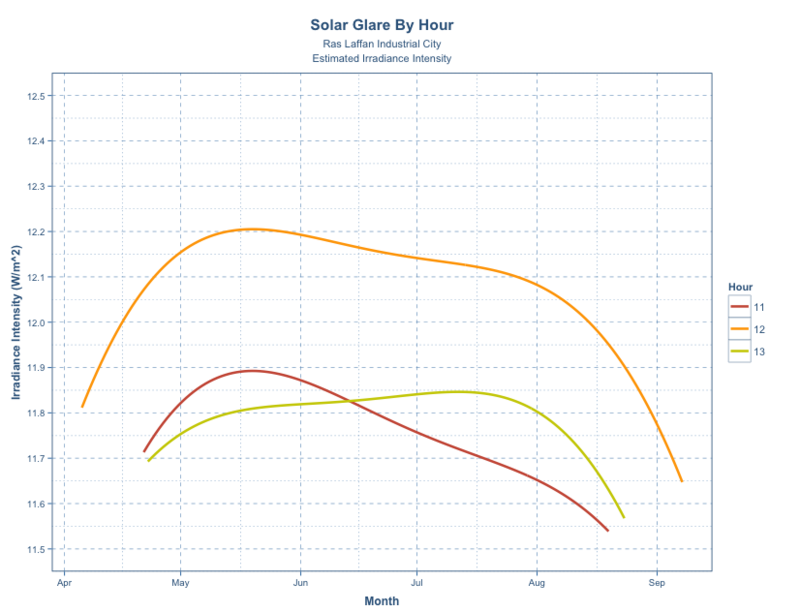 Glare intensity can vary depending on the PV module and module glass used. It can also vary given local atmospheric conditions and dust accumulation on the PV panels. As a result, glare intensity in practice can vary widely across projects and locations. Numerous aviation studies have been conducted to assess the intensity of reflected sunlight on the human eye for purposes of reinforcing aviation safety. One report, A Study of the Harzardous Glare Potential to Aviators from Utility-Scale Flat-Panel Photovoltaic Systems, undertook research at the Las Vegas, Nevada airport. The study relied on ocular safety metrics, which quantify the potential for a post-flash glare after-image on the back of the human eye. The study presented the graph above. Other common materials presented greater risk to aviators, including white Portland cement, snow and the structured glass of building towers. 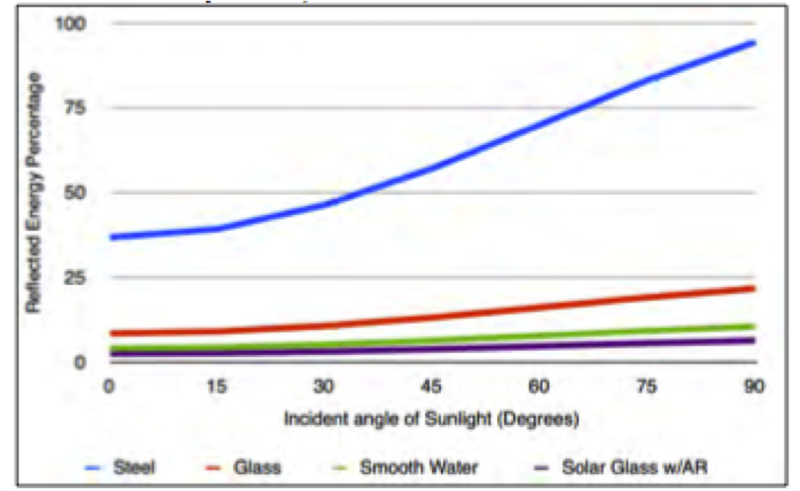 The U.S. Federal Aviation Administration (FAA) has also conducted comparative studies of the specular reflection from PV modules.2 The following graphic on the relative reflectivity of different surfaces was sourced from the FAA. It is interesting to note that reflections from vegetation are deemed a greater hazard than solar PV panels by the federal aviation regulator. In practice, aviation safety risk cannot be ignored. However, glare risk to aviators is easily mitigated at low cost through the use of protective eyewear, such as glare resistant sunglasses and visors. Secondary precautions, if required, include limiting flight path activity for very short and discrete periods during the year. Finally, another study presented the following relative reflectivity and presented the following graph.3. Again, independent research confirms that reflections from solar PV modules are possible, but less than the risk posed by steel structures, water or office tower glass. All 3 studies also make clear that the reflective glare does not have one simple scalar that defines glare intensity. 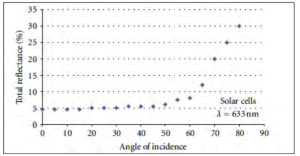 Variation in study results are a function of the different PV modules tested and differences in measurement methods. As a result, projects should rely on EPC specifications for equipment purchasing that have no glare potential or the lowest glare potential possible. Relocation of the PV project is not justified based on the potential of a sunlight glare impact or safety risk to the MPAC office tower. Published aviation studies suggest that the risk to pilots is also low and easily mitigated at low cost. The long-term health and safety focus of the project should include activities to measure the specular reflections generated by the solar modules to ensure minimal aviation risk and proper precautions. Data collection is required for Qatar specific conditions and results should be incorporated into front-end design engineering as a core standard for PV modules. 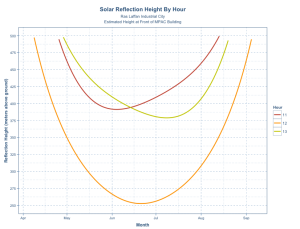 # (3) if the azimuth angle of the Sun confirms of eliminates the glare risk. # module in the front row are used and the remaining points are equally spaced. # TMY profile similiar to that used by PVsyst. # reflected sunbeam is actually hitting the building or not. # module. The code also calculates extra-terrestrial irradiance for any date/time. 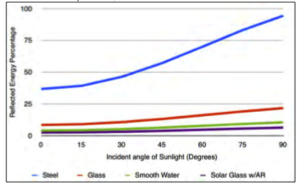 # safety, then actual irradiance profile should be used. # define glare intensity using a glare coefficient or the % of sunlight expected to be reflected. # mod.perp defines the relection/deflection boundary and is a line perpendicualr to the module. # reflect North. 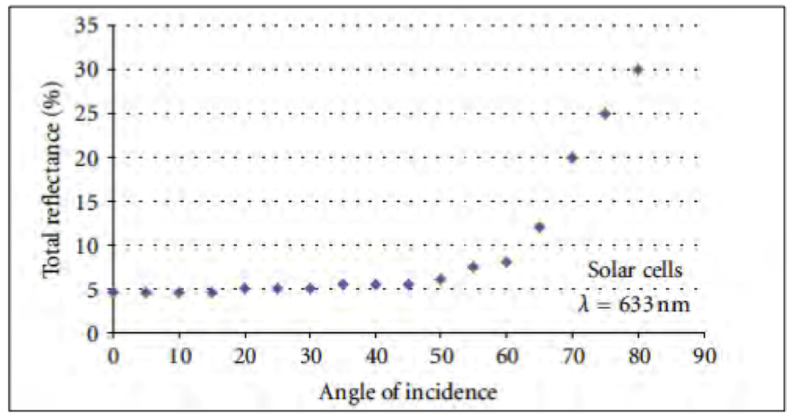 Udate angle.sort if deflection angles to the South are relevant. This entry was posted in Engineering, Projects. Bookmark the permalink.